Doug Johnson started at a young and impressionable age of 15, and attributes his "no bias" mentality to his youth. Pursuit in quality is the top priority in working in small gene pools and shrinking gene pools are a factor that even popular breeds are facing. Pursuit in quality means that there is "no bias" towards or against the kennel or "camp" that the dog is associated with. Doug Johnson breeds by physical trait, dogs that look alike or resemble each other regardless of the pedigree. Genetic testing is a must-use tool, especially when breeding internationally. Search the globe and exchange dogs internationally. Consider building bridges by exchanging dogs with top international breeders for a second or third generation "puppy back". We can't be be island breeders anymore. 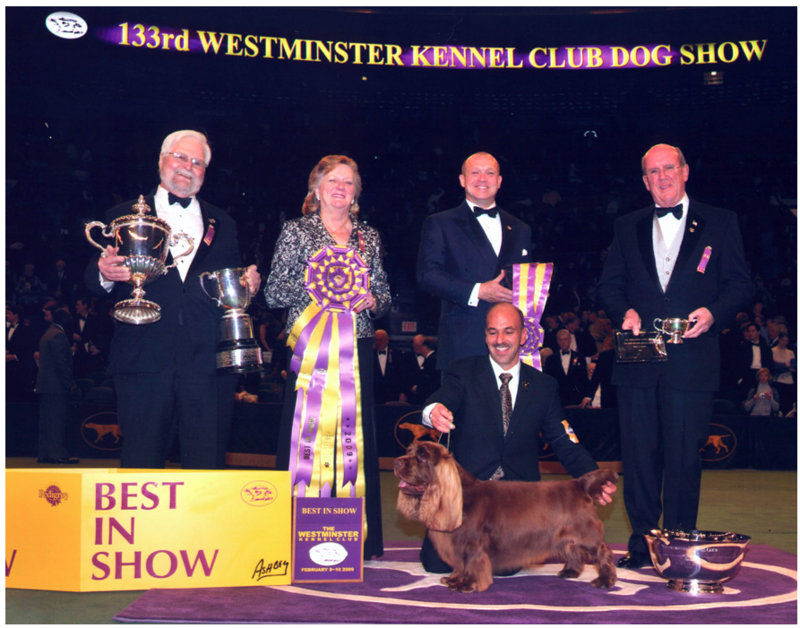 Resist the "Americanization of Show Dogs" fashion trend. Dogs are bred to standards and should look and be the same everywhere. The English Springer Spaniel in the U.S. for example, has lost proper croup for a "showier" presentation in the ring. Yes, Test AND TELL!!! It's not about you. Small gene pools cannot survive without the sharing of test results, good and bad. As genetic testing improves, the necessity for greater understanding, education, communication and reliance on other breeders is needed. The perfect dog without a specific recessive gene may be in Australia, or Germany or even Russia. Look at the success of the African Basenji Project featured in Pure Dog Talk #67. Don't believe the press. You're top winning dog may not be the best example of your breed. You may have had better dogs in the past, and this is just the best one at this time. Want success for other people. Keep every door open and commit to lifelong learning. Elevate who you are and be honest about your animals. Above all, be grateful. Be grateful for others and grateful for our dogs and what they give us all. Loved this!! Informative, inspiring and insightful. A very enjoyable & unique look at breeding and for me in particular , our wonderful breed of our rare Clumber Spaniels . Thank you for this. Not all of us can so eloquently explain and visualize the importance of stamping a lovely recognizable type. Excellent practice. Type to type. Excellent , concise and very informative! Forward thinking breeding seems to be something that is missing today hence the smaller gene pool of quality examples of our breeds.